How do you know when a super fight is near? When people who don’t watch boxing start talking about boxing. At my gym (non-boxing), I heard someone ask “You going to watch the fight coming up?” Yes, “the fight” says it all. A chance meeting at a Miami Heat game between Floyd Mayweather and Manny Pacquiao helped make this fight a reality. From then on, talks between the fighters progressed to the promoters and surprisingly, it didn’t take long to get this fight signed and official. After 2010, I lost hope of this fight ever happening. Olympic style drug testing and failed negotiations knocked this fight out and set boxing back a bit. Pacquiao lost two straight fights in 2012 and that closed the book on this fight for a while. Boxing was missing out on a super fight. After all, how strong is the sport compared to others when you can’t make the biggest fight happen? Fortunately, this super fight is here and is just as big if not bigger than it would’ve been in 2010. In 2010, there is no way a PPV fight would be sold for $90 standard and $100 HD. This is the most expensive PPV in boxing history, and it’s all because both sides realized this fight needed to happen. Mayweather-Pacquiao should’ve happened in 2010 without a doubt. But the delays and anticipation have only built this fight up over time. Top Rank/HBO Vs. TMT/Showtime turned into the first HBO/Showtime joint venture since Lewis-Tyson in 2002. And this fight will be much more competitive than that one. We have two of the best p4p fighters who’ve fought virtually everyone except themselves, until now. Two fighters with big yet very distinct fan bases get to meet in the ring. Money brought these fighters together, but I think something deeper also played a part in making this fight happen. Before he temporarily retired in 2007, Mayweather was the p4p no. 1. During that time, Pacquiao started hitting his stride, getting the best of Erik Morales and winning a war against Juan Manuel Marquez. Pacquiao started as a flyweight world champion and moved up to face a former Mayweather opponent, Oscar De La Hoya, at welterweight in 2008. Where Mayweather had a split decision win over Oscar, Pacquiao dominated him, stopping him in 8 rounds. The same thing happened when Pacquiao fought Ricky Hatton. Mayweather had a close competitive fight with Hatton while Pacquiao steamrolled him easily. This trend of Pacquiao doing better than Mayweather with the same opponents continued with Miguel Cotto and Shane Mosley. Though there’s one common opponent that tells us the rest of the story leading up to the big fight: Juan Manuel Marquez. Mayweather returned to the ring after a near two year hiatus to fight Juan Manuel Marquez in late 2009. Mayweather knocked JMM down a couple times en route to a unanimous decision win. JMM is a very good technical boxer and counter puncher who gave Pacquiao hell over 4 fights, including his infamous KO win in 2012. Styles make fights is a boxing cliché, but one that rings true here. Pacquiao sometimes struggles with elite counter punchers. Someone that can set the pace and give Manny something to think about with his punches can give him a tough time. Floyd is not only faster than Marquez, but he also has solid defense and is the better boxer. Since that fight, Floyd has beaten undefeated Saul Alvarez and had 2 fights with Marcos Maidana: edging the first fight and adjusting in the second for a clear decision win. Floyd knows a thing or two about being in a dog fight, and his ability to adjust has won him a couple close fights. The Marcos Maidana fights do give Pacquiao hope, especially since Pacquiao is faster and probably hits just as hard as him. Floyd Mayweather, undefeated at 47-0, embodies the 0 in his record. Manny Pacquiao carries the nation of The Philippines on his shoulders in and out of the ring. Both carry big entourages in and out of the boxing gym. Pacquiao has delved into politics and professional Filipino basketball, while Mayweather is a fight promoter with his own TMT clothing line. 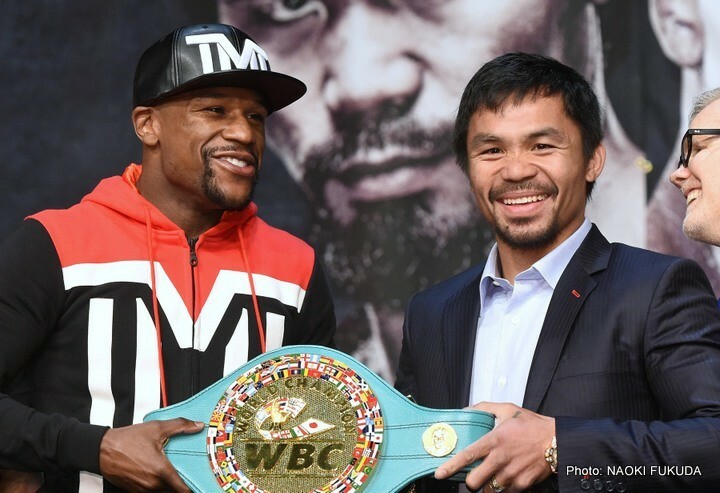 Both come from troubled backgrounds: Manny with poverty and Floyd with family strife. The unique ways these two fighters carry themselves add interest to the fight. The background stories without the p4p mentions are enough to sell a fight. The fact that these two and their camps have went through years of trash talking and blame adds another layer to this fight. Since this fight was signed, the press conferences and fighter meetings have been much tamer and professional than expected. At the end of the day, it all comes down to fight night. Both fighters have distinct styles that make them successful. Mayweather uses the shoulder roll defense, counter punching, and a good control of pace with his ring generalship. Pacquiao is a southpaw who attacks with speed and angles, and has a tremendous left hand. I see this fight starting slow with both guys feeling each other out. Mayweather will try to establish control in the center of the ring while Pacquiao darts in and out with the left hand. The early rounds will be competitive with Manny landing solid shots on Floyd, though Mayweather will have the slight edge with his counters. After round 6, Floyd adjusts and boxes his way to a unanimous decision win. Mayweather UD. Whatever the outcome, boxing is the real winner in this one. The fans finally get the much needed super fight, and it’s turned out to be even bigger at this later phase of the fighters’ careers. Every generation has a super fight, and this is ours. This is a fight for legacy that will determine who really is the p4p king.